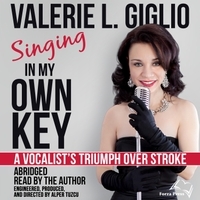 Valerie Giglio was a professional singer when she suffered a stroke that completely paralyzed her left side and stole her singing voice, and she returned to the stage just one year later. Singing In My Own Key is a story of hope and faith that will leave you deeply inspired. All product and company names referenced in the audiobook and/or text are trademarks ™ or registered trademarks ® of their respective holders. Use of them does not imply any affiliation with or endorsement by them. I have tried to recreate event, locales and conversations from my memories of them. Some individual names have been changed to protect anonymity. Although every precaution has taken to verify the accuracy of the information contained herein, the author and publisher assume no responsibility for any errors or omissions. No liability is assumed for damages that may result from the use of information contained within.